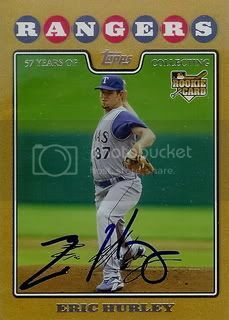 After missing some time with injuries, it looks like Texas Rangers pitcher, Eric Hurley is back on track. He's been throwing a lot this Spring and should be ready to go once the season starts. I wouldn't be surprised if he is assigned to the Rangers Triple A team in Oklahoma. 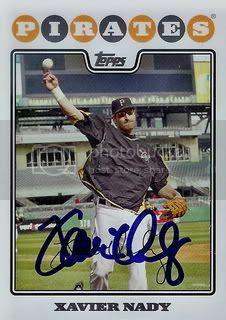 The other day he signed his 2008 Topps Gold Border Parallel card for us. 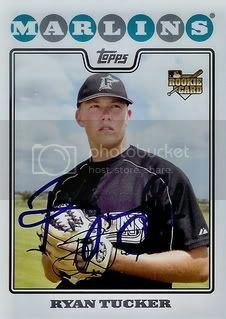 Former Florida Marlins pitcher, Ryan Tucker is a non roster invitee for the Texas Rangers this year. The other day, he signed a card for our set. Spring Training games start today and it's time to start posting some of the cards we've gotten signed this year. I'll start off with a few Texas Rangers. 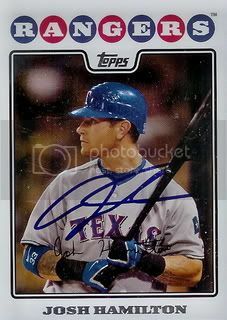 Former Boston Red Sox catcher, Kevin Cash is with the Rangers this Spring. He signed his card from the Updates & Highlights set for us. He also gave my son a baseball. Thanks, Kevin! A few weeks ago we picked up Joe Saunders 2008 Topps Black Border Parallel card in hopes of getting it signed at the Diamondbacks Fan Fest. We were successful! This is the first Black Border Parallel card that we have been able to get signed. Very cool. Another Fan Fest success. Joe Saunders signed the Gold Border Parallel if his regular card for us. 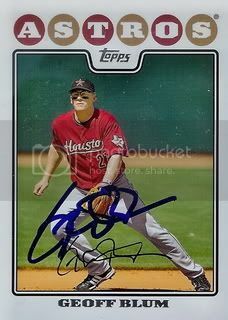 Joe Saunders signed his All-Star card for us at Fan Fest. Another nice addition to our collection. 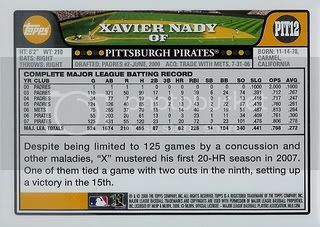 The final card Xavier Nady signed for us at Diamondbacks Fan Fest last weekend was his card from the Pittsburgh Pirates 14 card team set. Xavier Nady signing with the Diamondbacks was great news for me. 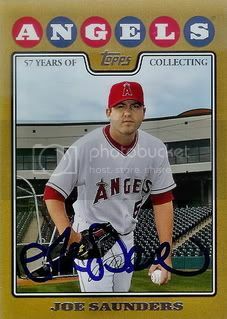 I had a few different 2008 Topps cards for him to sign. The third card is his Gold Border Parallel from the Updates & Highlights set. 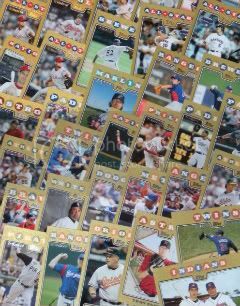 In 2008, Topps decided it would be a good idea to make a gold foil parallel version of all the base cards. Instead of the regular silver foil, cards with gold foil were randomly inserted into packs. I have very little interest in trying to get many of these signed. 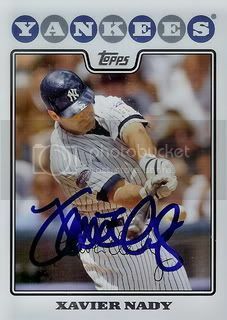 If I have one and have nothing else 2008 Topps-related for the player to sign then it will due. 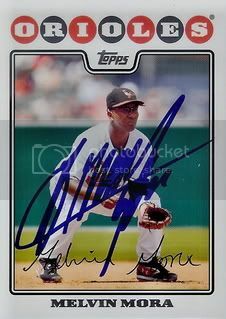 That being said, Melvin Mora gets the distinction of signing our first gold foil card. Thanks, Melmo! I was hoping to get Melvin Mora's autograph at the Diamondbacks Fan Fest and I did. 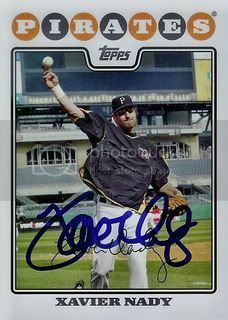 He signed his card for our 08 Topps set. He was a two-time All-Star during his time with the Baltimore Orioles. 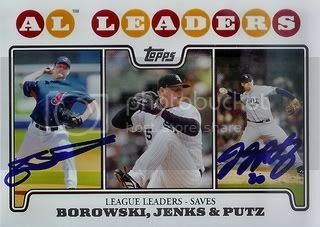 Earlier this month, Joe Borowski signed the AL Save Leaders card for us. New D-Backs closer, J.J. Putz is on the same card. We were able to get him to sign it for us at Fan Fest last week. Aaron Heilman didn't have a card in the regular 08 Topps set but he did have one in the 55 card New York Mets Team Gift Set. Another nice addition to our collection. 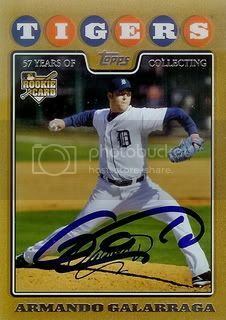 Fortunately we also had Armando Galarraga's Gold Border Parallel card to get signed at Diamondbacks Fan Fest. Great card. Our 2011 Diamondbacks Fan Fest posts continue with former Detroit Tigers pitcher, Armando Galarraga. I was glad to get Armando's autograph. Probably had something to do with his near perfect game. 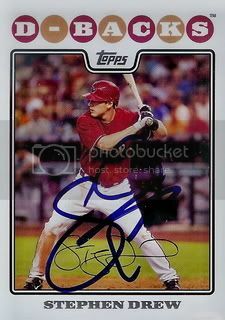 One of my main goals for this year's Diamondbacks Fan Fest was to get Stephen Drew to sign his card for our set. I got to Chase Field extremely early Saturday morning. Earlier in the week I had bought a few Subway sandwiches so I could become a Subway VIP. The VIP included an early entry to Fan Fest... after the season ticket holders. Despite being near the front of the VIP line, a few of the autograph tickets were already sold out by the time I got to the front of the line. The sessions for Justin Upton, Kirk Gibson, and Drew were all gone. I was a little disappointed but I still got tickets for a few good tables. Once inside, I got lucky and caught Stephen walking around in between events. 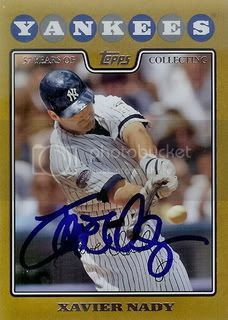 He graciously signed our 2008 Topps card. Thanks, Stephen! Glad to have finally this one as part of our set. 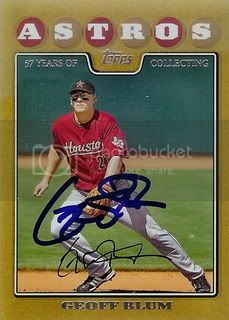 Along with the regular 08 Topps Updates & Highlights card, we also had Geoff Blum sign the Gold Border Parallel. Thanks, Geoff! 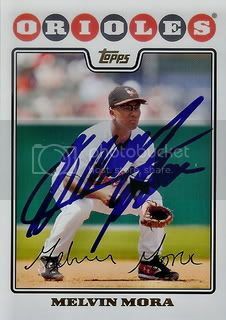 Not only were we able to get Geoff Blum's Series One card signed, he also signed his Updates & Highlights card too. I ended up doing better at the Diamondbacks Fan Fest than I thought I would. 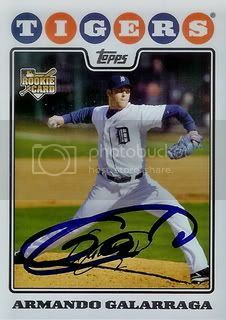 I'll be doing posts for each of the 2008 Topps cards I was able to get autographed all this week. First up is newly acquired infiedler, Geoff Blum. It's that time of year again. 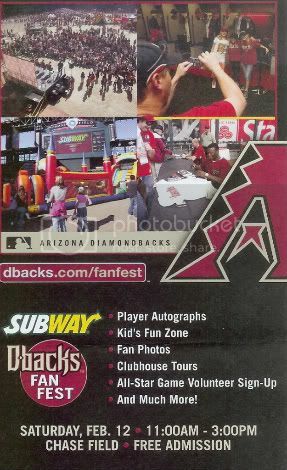 The Diamondbacks Fan Fest is basically a kick off party to begin Spring Training. It's usually held the week before pitchers & catchers report and is a good warm up for the real autograph-related action. Hopefully I'll be leaving with a few newly signed 2008 Topps cards and maybe a few other surprises. Wish me luck and check back soon. We should have posts up showing what we got all next week. You might remember our "2008 Topps Opening Day White Border Parallel Lot # 1" from two weeks ago. I liked those seven cards so much, I decided to just go ahead and buy the set. 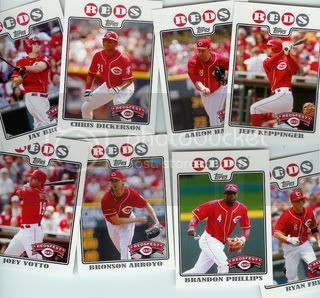 Thanks to eBay I am now the proud owner of all 220 2008 Topps Opening Day White Border Parallel cards. Each is numbered to only 2199. Pretty cool. 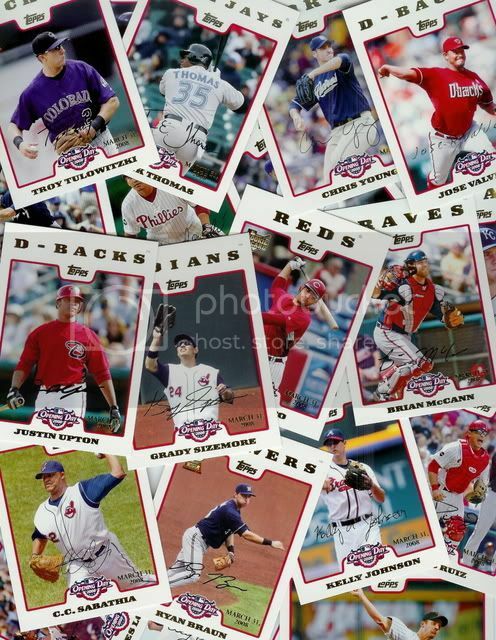 Today ushers in another historic moment here at My 2008 Topps Set Blog. Here is our first signed 08 Topps card from the basketball set. 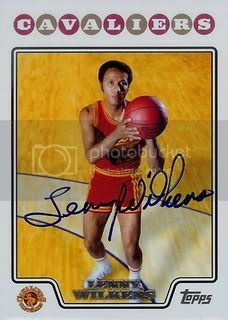 It is of three time Basketball Hall of Famer, Lenny Wilkens. That's right he's been inducted into the Hall of Fame three times. Once as a player, once as a coach, and once as part of the 1992 Olympic Dream Team. No, I won't be trying to get the entire basketball set signed but I'll probably pick up a few here and there of players who sign TTM. I've been wanting to get this one for awhile and I'm glad it is now part of our collection. 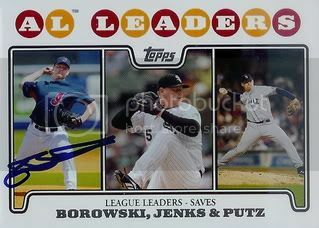 In addition to his regular card, Joe Borowski also signed the AL Save Leaders card for us. This is the first League Leaders card we've gotten signed for our set. Got a nice TTM return today. 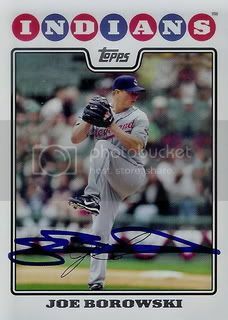 Former Cleveland Indians closer, Joe Borowski signed a card for our set. 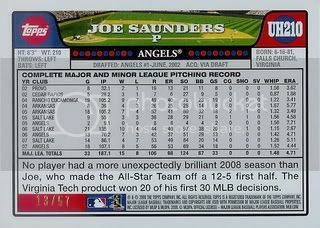 Joe led the league in saves in 2007 with 45. Not too bad. (CBSSPORTS.COM/C. 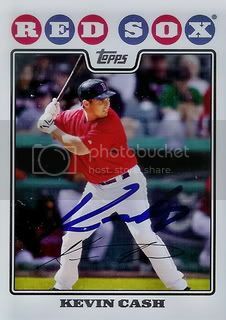 Trent Rosecrans) – Ringo Starr and Nomar Garciaparra may have something more in comment than a prominent proboscis — both take care of their fans autograph requests, even if it’s not in that timely of a manner. In the second season of the Simpsons, there’s a story of the Beatles drummer personally returning all of his fan mail and finally getting to a letter and painting from young Marge. Starr is at letters from 1966 — 25 years before the episode aired. Turns out, Garciaparra is a little quicker than Ringo, so he’s got that going for him. “Hello, Chad? Were you expecting mail at our house? This plain envelope came in the mail, no return address, and…it looks like all in your handwriting?”. I had NO idea what she was talking about. Naturally since I now live 3,000 miles away from Florida, I asked her to open it. “It’s these baseball cards from a Nomar Garciaparra? 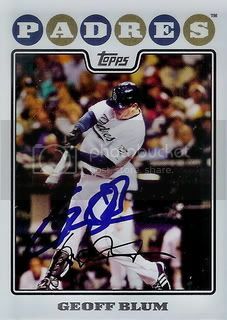 One is signed” Garciaparra, or someone acting on his behalf, send the larger signed card seen below, and sent back the original Donruss card Chad sent back in 1997. Hey, better late than never — and it only took 14 years, although, as beloved as Garciaparra was in his time in Boston, he was never exactly a Beatle. But good on him for getting around to it. I think it’s pretty cool he’s doing that. And at it least made an interesting story for a slow Monday as we wait for spring training to begin. I heard about this on the local sports talk radio station a few days ago and thought it was pretty cool. I googled it to see if I could find out more. I found a few articles but CBS even included a picture. I don't want to ruin Chad's good story but does anyone else think that looks like a standard issue postcard with a preprinted autograph? Just picked up our seventh black border parallel card. This one is of former Angels and current Diamondbacks pitcher, Joe Saunders. Along with the autographs, Ryan from The Great Orioles Autograph Project sent along a stack of 08 Topps gold border cards. Thanks, Ryan. These are awesome! Ryan from The Great Orioles Autograph Project sent over a nice package that included three signed 2008 Topps cards for our set. 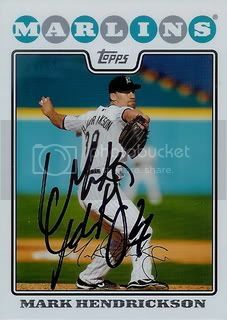 The final card is of former Florida Marlins and current Baltimore Orioles pitcher, Mark Hendrickson. I did a quick Google search on Mark. I remembered that he had played basketball previously but I didn't realize he played in over 100 games for four different teams. Thanks for the great cards, Ryan! 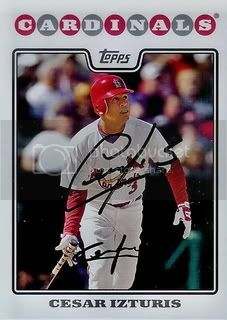 The second is also of Cesar Izturis. Yep, he had two cards in the 08 Topps set and thanks to Ryan we now have them both! 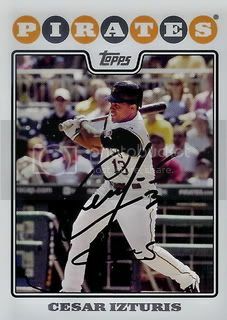 The first card is of former Pittsburgh Pirates and current Baltimore Orioles shortstop, Cesar Izturis. 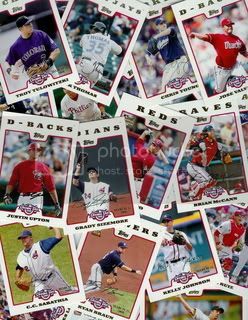 Topps produced an eight card set for the 2008 Redsfest. 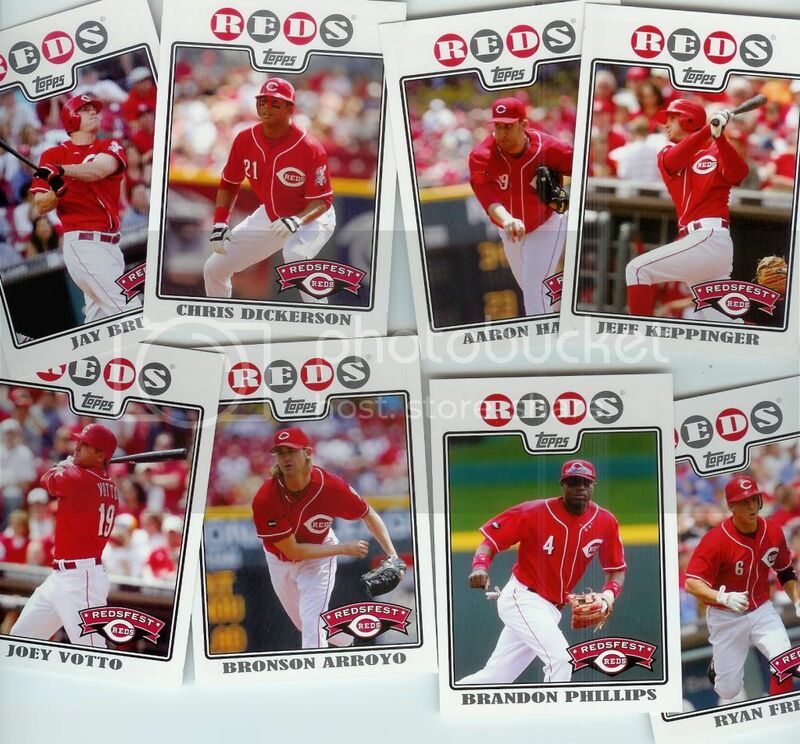 These are very similar to the regular issued 08 Topps cards but feature a nifty Redsfest logo. Pretty cool and definitely a nice addition to our 08 Topps collection. 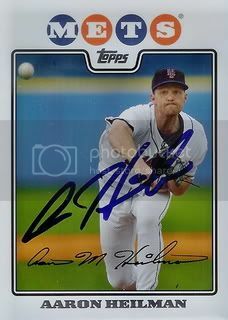 Our friend Raiderdan came through with one more signed 08 Topps card that was signed last year. I've actually had this one for awhile but hadn't gotten it scanned. 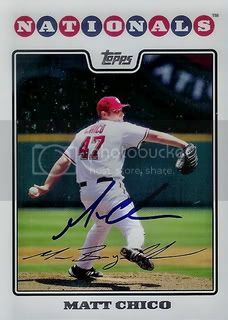 So here it goes... Matt Chico... our 373rd signed 2008 Topps card.